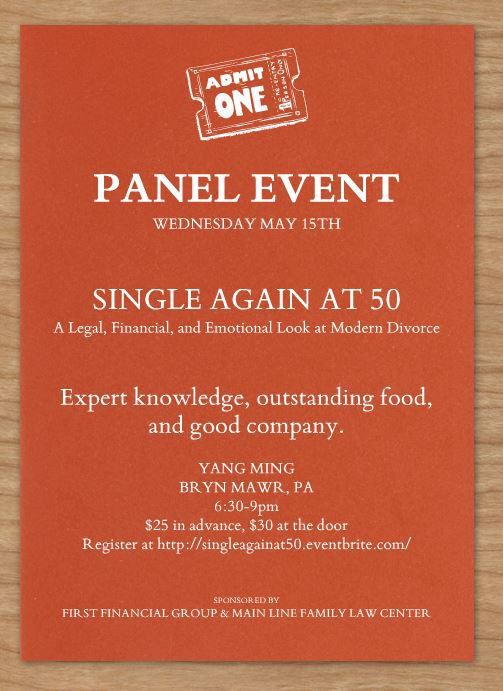 The panel event, Single Again at 50: A Legal, Financial, and Emotional Look at Modern Divorce, will be held on Wednesday, May 15, 2013 from 6:30 to 9:00pm, upstairs at Yangming in Bryn Mawr. Between 50- 60 attendees are expected and is ideal for men and women approaching divorce, in the midst, or newly single, as well as professionals who work with divorcing clients. Sponsored by Main Line Family Law Center and First Financial Group, the event will explore divorce at mid-life and beyond, impact on older children, dating and relationships, finances and retirement. Attendees will also learn about legal and financial options as well as resources for emotional well-being. The event is co-sponsored by Events with a Purpose, specializing in non-profit and corporate philanthropy. The panel features: Cris Pastore, Esq, President & Divorce Attorney-Mediator, Main Line Family Law Center, Mark Dubowe, Financial Services Representative, First Financial Group, Katey Moody, Psychotherapist/Specialist in Transition, Divorce and Empty Nesting, and is moderated by Adina Laver, Divorce and Life Empowerment Coach. Attendees also receive a free ebook of Divorce in PA, The Essential Guide, newly published by Main Line Family Law Center.